How To Live Happily Ever After With Multiple Business Intelligence Tools. FREE Webinar on 20 June 2017 with Boris Evelson, vice president, principal analyst serving application development & delivery professionals, Forrester and Heine Krog Iversen, CEO, TimeXtender. In the earlier days of Business Intelligence ”Management Information Systems” were the words. Automation only covered scheduling and running reports once a month. Today, we are constantly being made aware that “Data is the new oil,” and that being a data-driven company means having data officers and stewards on board. In addition, this requires a company to invest, analyze, and visualize across all of its functional departments. And sometimes, a unified Data Warehouse project is defined and takes place over a period of several years, only for the participating parties to find out that during the process, or maybe even after the process, what their requirements really were. The real question is this: how do we approach the ever-growing amount of data, along with the freedom of choice, when it comes to picking the right BI front-end for the needs required within each department? Perhaps a solution might be to agree to not agree on a specific front-end? Also, how about collecting as much data as possible and looking for a solution that offers both a curated version of the truth and consolidated data, but also allows, even encourages, access from multiple front-ends. The comprise? In order to accommodate, we could all agree to use the same business terms; revenue is revenue, calculated as agreed upon, and presented in a semantic layer for every report service with a BI front-end and analytics tool to take advantage of. With that as a backdrop, Boris Evelson from Forrester will be joining us as guest speaker in a Webinar on 20 June 2017 to share his extensive experience of BI implementations. He will join TimeXtender CEO Heine Krog Iversen, who will also share his views on how we can achieve the happy fusion between multiple front-ends gathered in a one-stop platform, one that covers an end-to-end solution for Business Intelligence and Analytics tools to build data stories and discoveries. Registration to this Webinar is FREE. This is one online event you won’t want to miss. Visit here today to register. 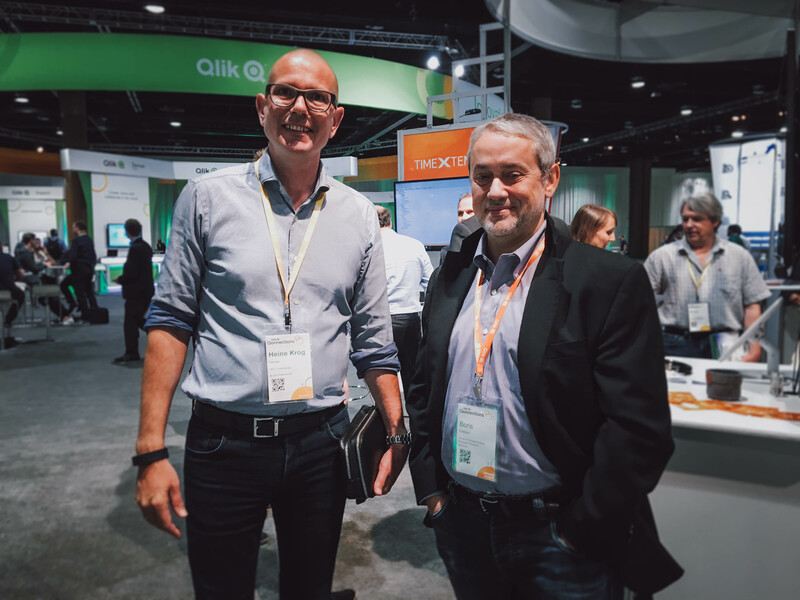 CEO Heine Krog Iversen and Boris Evelson at Qlik Qonnections 2017.